First and foremost, you have to up your transportation game! The seating and van size were absolutely unacceptable. Our guide was a little inexperienced but he was a native Tasmanian and had a great energy. Hikes were awesome. Great vistas and incredible views! The tour was very well organized. The various sights were amazing and there were enough breaks so that the long stretches of driving were easy to do. The driver/guide was very knowledgeable and accommodating. Well we started off in Hobart on 14th feb 2018 visiting New Norfolk,Mt field Nat Park and Russel Fall,all very impressive,Tungatinah Power Station,Lake St Clair,Nelson Falls,Queenstown on our way to Strahan for our first night stay.Day 2 was up early to visit Montezuma Falls and the Metal Suspension Bridge which was very scary for me.All very impressive walking thro the Forest on the way to the Falls. Not vey pleasant in the pouring rain. Then we visited Roseberry,Henty Dunes which was very nice and back to Strahan for our secon night stay with a Barbecue Laid on by our Leader. Accomodation at the Backpackers Lodge was very good. Day 3 we we maide an early start to Cradle Mountain a which was shrouded in mist because of the persistent rain we were experiencing.We all did the Dove Lake Circuit in the Rain but views of the Lake and Scenery made up for it. Then it was off to Ashgove Cheese Factory for tastings and Coffee. Then on to House of Anusers for chocholate tasting etc.Then stopping at shefield for Groceries we arrived in Launceston for our 3 night stop.Up early again on the 4 day to Bay of Fires with mazing Rock Formations.A visit to St Helens was next and then on to the Wild Life Sanctuary to see the Feeding of the Tasman Devils,Quells and Wombats.We then arrived in Bischeno for our nightly stop.An early start was made on the 5th day to Wine Glass Bay Lookout. Some of us went to the beach down below. While others just went to hazards beach. The Climb up to to the Lookout over Wine Glass Bay was exhausting to say the least. It was for me!!!!. Then we went to see the Swansea Lighthouse which was interesting. Then on to Kate Berry Farm to taste the Ice Cream. Passing through Orford we arived back at Hobart around 05:30 pm on 19th Feb 2018. All in all a very interesting trip but far too much walking for my liking. A thoroughly mixed bunch of passengers who got on with each other very well.I must commnd the Driver as weel who was very knowlegeable and drove the Bus well. This is entirely my own opinion. love the active lifestyle to get to all of tassies gems. out guide Travis gets 5 stars too. he was the mom for our group always looking out for us and going out of his way to make it a lovely experience. My son and I had a fantastic time in Tasmania. Thanks to Kym everything was very well organised and easy. Her sense of humour and outgoing nature has put everyone at ease and our group became like a little family within a day!! So much to see and all the activities vary greatly, never any time to get bored. Thank you so much, would recommend this tour highly. Kym, you were an absolute star!! Absolutey fabulous!!! If you do not want to drive and only have a short period of time, join this tour. The tour covers a lot of places in Tasmania. Our guide Trent was fab. He is always on the lookout for us to see the wildlife and plan according to the weather. The walk to Marion Lookout in Cradle Mountain was stunning. Hard work but worth it. The hostel that we stayed was brilliant except Launceston Backpackers which we stayed only one night. The bay of flies was stunning. Losts of photo opportunities. Small group makes this more fun as we get to know the group better, The best group so far!!. Make sure you bring proper walking shoes and towel. Otherwise enjoy the ride. It was such a good adventure! We walk a lot but we saw astonsihing view . Finally, the guide is really friendly. Justin loves what he does so he will be able to explain you all about history about the places. 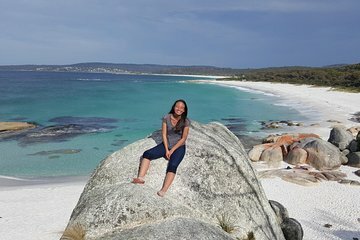 Excellent short break that includes lots of the highlights of Tasmania. Our guide, Luke, was very professional, knowledgeable, well organised and did as much as possible to show us his Motherland. It was a wonderful tour - with amazing people, itinerary and transportation. Ben is a super knowledgable and detail-minded guide who gives detail information about the place, climate, geography, animals and basically everything interesting to us. The stunning and sensational scenery has imprinted in my mind, I will definitely be back. Super Highly Recommended! Best tour ever, from start to finish, fun fun fun! Great group of people, our tour guide Leith was good and professional. Accommodations were really good for hostels, the itinerary was great and i would definitely come back and do this again!